We’ve been working to better utilise umami, the so-called fifth taste, for some time now. Understanding the relationship between free glutamates and the nucleotides disodium inosinate(IMP) and disodium guanylate (GMP) is all very well, as is appreciating the way umami interacts with sweet, sour, salty and bitter sensations. But what ultimately matters is that we make use of umami in a way that remains true to our own cultural heritage. And, perhaps most importantly, that we don’t alienate Western palates. Part of the solution simply lies in appreciating the way cuisines from all corners of the globe have traditionally utilised umami-boosting ingredients and techniques to improve the flavour of their food. Umami may be most closely associated with the Japanese – where kombu (glutamate), bonito flakes (IMP) and shiitakes (GMP) provide a holy trinity – but umami-boosting ingredient combinations are just as readily found elsewhere. Serve a dish with beef, a hard Parmesan-style cheese, tomatoes and mushrooms, for example, and you’ve got one hell of an umami party going on. But there’s still undoubtedly a trick or two to be gleaned from Japanese cuisine, not least in the use of dashis to enhance fish, meats and sauces and seaweeds as an addition to cures. Already well aware of the value of salt cures and brines for fish and shellfish we’d also recently been looking at the age-old coastal traditional of cooking using seawater. Adding seaweed to a brine to create our own fresh ‘seawater’ was a logical next step. Less obvious, perhaps, was the idea of then adding vinegar to the mix. The resulting broth was astonishing, a tsunami of umami that boldly re-iterated the synergy between salty, sour and glutamates on the taste buds, and immediately suggested a whole bunch of new applications in the kitchen. Try it with fish. Try it as a pickle for vegetables (we love it with broccoli stem sheets). Try a spoonful straight up, if you dare. Just make sure you give this one a go. 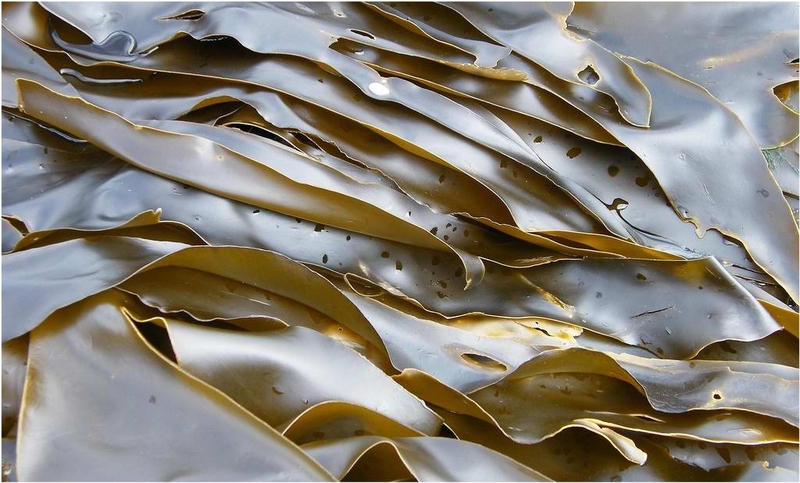 * For this recipe we buy a kelp from Sea Veg in Ireland rather than using a Hokkaido-sourced variety of Laminaria Japonica. For a general purpose sour brine: Add salt to water at 30 – 40 percent. Heat and stir occasionally until salt dissolves. Add equal quantity of vinegar to water and take to 70 degrees c and set aside. Add 20g of kombu for every litre of total liquid. Leave to infuse for 15 minutes. Remove kombu. Strain and cool. For a straight-up kombu seasoned vinegar: Add salt to vinegar at up to 10 percent. Heat and stir to dissolve salt (try not to inhale the fumes!). Take liquid to 70 degrees c and set aside. Add 20g of kombu per litre of liquid. Infuse for 15 minutes. Remove kombu and strain and cool. Note: The measurement guides give a starting point for general brining purposes, but feel free to play around with the quantities to get something with a saltiness and bite to suit your own tastes. And don’t throw away that kombu. It can be re-used, eaten as is, or – even better – deep-fried to create an incredibly savoury (almost mackerel-flavoured) snack or garnish. This entry was posted in Recipe, Test Kitchen and tagged brine, cure, kombu, umami, vinegar. Bookmark the permalink.